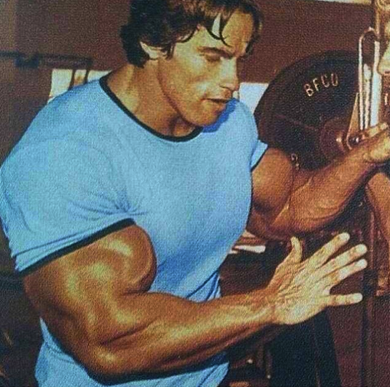 We all want to be making progress in the gym, but unfortunately, many lifters remain stagnant. In general, you want to make sure you’re getting stronger over time. Getting stronger means using more load or achieving more repetitions with the same weight. This is the essence of progressive overload, which I discussed in great detail HERE. While there are a million ways to progressively overload, I’m going to outline a very simple system I use in my own training and with my clients. When I prescribe an exercise, quite often I will use the same load with all 3 sets, and I’ll simply note the total number of reps they achieve (this is in contrast to pyramids, which I wrote about HERE). Once they reach a particular total, I’ll increase the load. I first learned about this method from a Joe DeFranco DVD that I purchased many years ago, and it’s something that I’ve consistently sprinkled into my training since then. With this method, you want to keep the rest periods fairly consistent, say around 90-120 seconds. Let me give a specific example. For hip thrusts, I like 36 reps for beginners for the 3 set total. This isn’t based off of any particular research, it’s just an arbitrary number I use. Several weeks ago, I started my client Ciji off with 65 lb hip thrusts. She was able to achieve 20 reps, then 15 reps, then 15 reps on her three sets (resting around 90 seconds in between sets). This equated to 50 repetitions. The next session, I upped the load to 85 lbs. She performed 16 reps, then 14 reps, then 12 reps. This totaled 42 reps. Again, the load was too light for her. The following session, I upped the weight to 95 lbs. She was able to complete 12 reps, then 12 reps, then 12 reps, for a total of 36 reps. HERE is one of those sets. This was the exact number I was looking for, so it took me a few weeks to dial in the appropriate load. Since she completed the 36 reps with 95 lbs, I upped the weight for her next session. Just yesterday, I prescribed 115 lbs. She was able to achieve 10 reps, then 10 reps, then 8 reps, for a total of 28. I anticipate that next session, she’ll attain 36 reps, in which case I’ll move her up to 125 lbs for the next session. Notice the jumps that I’m making. Since Ciji is a beginner but is in good physical shape, I made mostly 20 lb jumps right off the bat (in addition, I was under-loading her, which called for bigger jumps). As she gains experience and as I hone in on the right load, I move down to 10 lb jumps. Eventually, the jumps become 5 lbs. The main point is that she’s going up in load or reps each week and is following some sort of progression system. By the way, I have her doing barbell hip thrusts one session and band hip thrusts the next, since she comes twice per week (along with various other exercises). You don’t have to stick to 36 reps. You can choose whatever number you want. I have different preferences. For goblet squats, I like 24 total reps.
For kettlebell deadlifts, I like 18 total reps.
For band hip thrusts, back extensions, and band seated hip abductions, I like 60 total reps.
You don’t even have to do a 3 set total. You can choose a two set total if you want. For most single leg exercises, I only prescribe 2 sets. For Bulgarian split squats, reverse lunges, step ups, skater squats, and single leg RDLs, I like 20 reps (for a 2 set total). For single leg hip thrusts, I don’t add load – I just try to improve upon the 2 set rep total over time. My brother likes to do this with bodyweight push-ups; he can do 90 reps in 3 sets, which he tries to improve upon each month. What if You’re Prioritizing Maximum Strength? If maximum strength is what you seek, then you want to make sure you’re getting in your lower reps, your medium reps, and your higher reps. This way, you reap the best of the strength and hypertrophy worlds, as these feed off of each other in the long run. I prefer to perform a lower number of reps for the lifts I’m trying to increase (in my case, squats, bench press, and deadlifts since I love powerlifting, but you can choose other lifts, such as weighted chin ups, or dumbbell bench press, or trap bar deadlifts). I might choose 12 reps for my 3 set total for the big three lifts. However, for assistance lifts such as front squats, block pulls, and incline press, I might choose 18 reps for my 3 set total. With targeted lifts such as hip thrusts, hammer strength rows, cybex leg press, and hammer curls, I might choose 30 reps for my 3 set total. Here’s an example. A couple of months ago I bench pressed (pausing on the chest for 1-sec) 270 lbs for 5 reps, then 4 reps, then 3 reps. Since I achieved the 12-rep total, I increased the load to 275 lbs. The next session I did 4 reps, then 3 reps, then 3 reps, for a total of 10 reps. The following two sessions I totaled 11 reps (this happens – you don’t always set PRs). Finally, I was able to get 275 lbs for a total of 12 reps (over 3 sets with around 180 seconds of rest). I moved up to 280 lbs and it took me several weeks to achieve the 12 rep total, and now I’m using 285 lbs. You won’t improve linearly in strength on any lift over the course of a year. Strength gains zigzag over time, but in general, each year you should be using heavier loads on your big lifts. Beginners will sky-rocket in strength, whereas advanced lifters will make much smaller jumps. You might want to spend 8-weeks or so with a particular total (say 36 reps), then switch to a different total for 8-weeks (say 24 reps). This will prevent boredom, frustration, and stagnation. Nevertheless, there are many ways to get stronger, but you need a system. There’s a popular saying that goes like this: “If you fail to plan, you plan to fail.” Utilize the simple 3 set total reps system to ensure progression and results. The post A Simple System for Progression: 3 Set Total Reps appeared first on Bret Contreras.